Karelia is one of the world's heavily paludified regions, with mires and water-logged forests occupying a third of the territory. This situation is due to a number of climatic and geo-morphological factors. 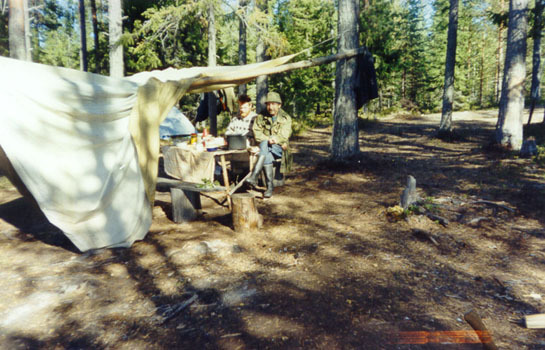 Mire formation in Karelia commenced about 9 millennia ago, and proceeded both by overgrowing of shallow bodies of water, and paludification of over-moistened land areas. At present, mires with a peat layer thicker than 30 cm cover about 4 mln. ha, and 1.5 mln. 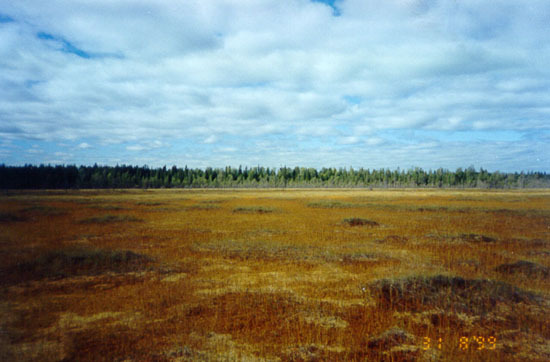 ha are covered with water-logged forests with a thin peat layer. 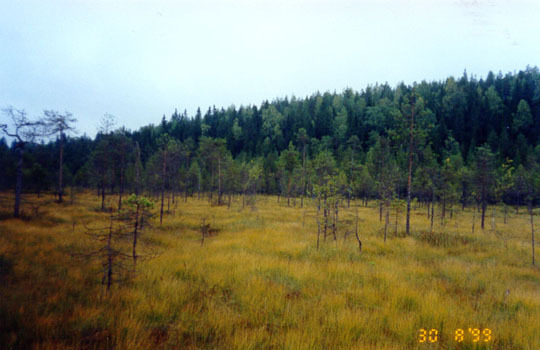 Mire ecosystems in Karelia, just as in the adjacent areas of Fennoscandia, demonstrate highly diverse flora and fauna, structure of the vegetation cover, genesis and stratigraphy. Biodiversity of mire ecosystems was assessed at various structural levels of their organization. 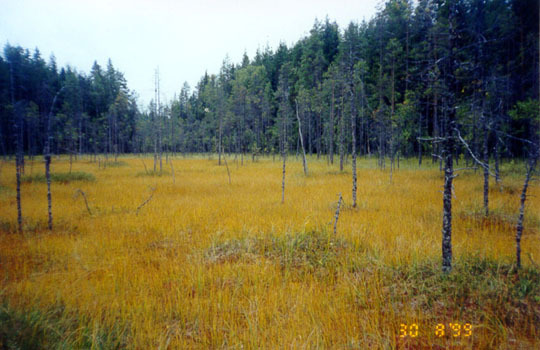 Wetland flora was found to include 289 vascular plant species (Kuznetsov, 1995) and 109 cormophytic moss species (Maksimov, 1988), of which more than 40 are rare and in need of protection (Red Data Book of Karelia, 1995). The vegetation cover of the wetlands is represented by a wide spectrum of moss, herbaceous, woody-moss and woody-herbaceous communities, and their combinations characterized by various trophic statuses. 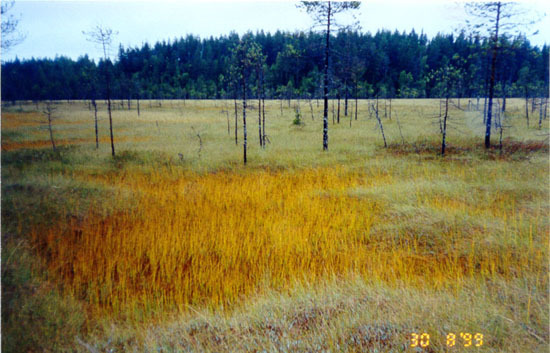 The most wide-spread types are ombrotrophic (raised) sphagnum string-flark and pine - dwarf shrub - sphagnum mires (the White Sea lowland and southern areas), mesotrophic string-flark aapa mires with swampy grassy pools (northern and middle Karelia) and mesotrophic herb-sphagnum mires (middle and southern Karelia). Water-logged forests are represented by a wide range of forest types at various stages of mire formation. 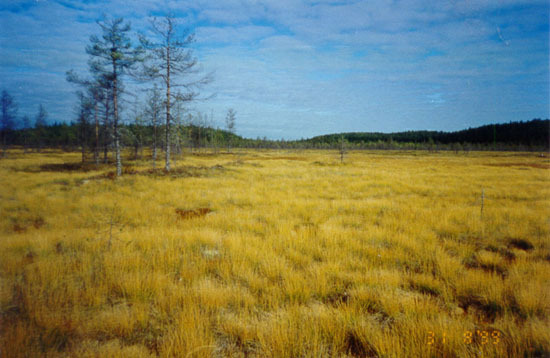 Large areas of mires and water-logged forests (about 720,000 ha) in middle and southern Karelia were drained in the 1950's-80's to suit forestry purposes. In a significant part of the drained land forest communities so far failed to develop to their full value. The republic has an extensive network of protected areas most of which include wetlands as a component. Several mire and integrated preserves (zakaznik), and 84 wetland natural monuments were established specifically to protect wetlands. Currently under protection are 130,000 ha of wetlands, which is insufficient for the preservation of the whole diversity of their types and plant communities. Therefore the network of protected mires should be considerably expanded.